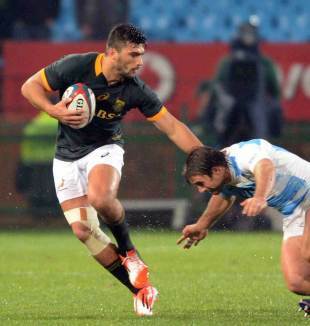 Ruan Pienaar's early try proved to be enough to give South Africa a 13-6 win over Argentina at a rain-drenched Pretoria. Last year's runners-up could hardly have got off to a better start, Pienaar charging through to score the opening try after just 82 seconds with Handre Pollard adding a brilliant touchline conversion to make it 7-0. However, with the greasy conditions leading to plenty of handling errors from both sides, that was as comfortable as it would get for South Africa and they were left holding on at the end before claiming a 13-6 victory. Nevertheless, the win still put South Africa to the top of the standings after Australia and New Zealand drew 12-12 earlier in the day. Argentina had lost 11 of their 12 matches since joining the championship, drawing the other, and it looked set to be another miserable afternoon for the Pumas as they found themselves trailing inside two minutes in Pretoria. Scrum-half Pienaar broke away from a maul down the blindside, exchanged passes with wing Cornal Hendricks before charging in at the corner. Pollard added the extras with a superb conversion from out wide and South Africa were off to a flying start. That seven-point difference would be as big a gap as the Springboks would enjoy in the entire match, though, as battling Argentina kept them within touching distance throughout. The Pumas missed the chance to get on the scoreboard when Marcelo Bosch's long-range penalty attempt drifted wide in the sixth minute, but soon after Nicolas Sanchez made no mistake to make it 7-3. Pollard responded with a penalty of his own to make it 10-3 before Argentina spurned a promising chance to notch a try of their own when Manuel Montero spilled the ball out wide. Both sides tried to make inroads in difficult conditions but the next score did not arrive until the start of the second half, when Sanchez reduced the deficit to four points with his second penalty. As in the first half, South Africa hit back quickly when replacement Morne Steyn split the uprights to leave the hosts leading 13-6 going into the final half-hour. And that proved to be the final score, although South Africa had to weather an Argentina storm in the closing stages with the Pumas coming agonisingly close to what could have been a match-tying try on more than one occasion.